Home / FREEBIES / I Got My FREE Purina One Product Coupon – Did You Get Yours? I Got My FREE Purina One Product Coupon – Did You Get Yours? Last month, I posted a super hot freebie for pet owners, and mine just came in! 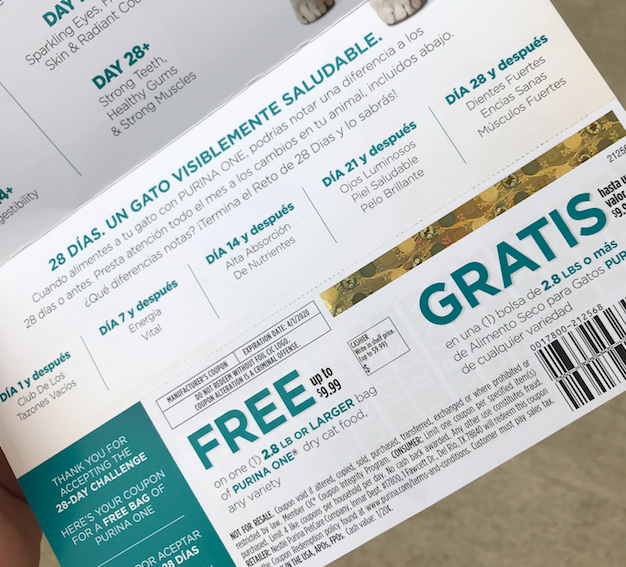 If you haven’t yet, you can take the 28-Day Purina Challenge to score a coupon valid for a completely FREE Purina One Dog Food or Cat Food product coupon! This coupon will arrive in your mailbox within 2 to 4 weeks. Even if you aren’t a pet owner, this can make an excellent donation item. So, be sure to request this freebie if you haven’t yet! If you requested yours previously — did you get it yet?